RIBA published the DfMA overlay to the RIBA Plan of Work in 2016. One of the key recommendations is to front-load the design process by bringing specialist subcontractors and consultants on board as early as stage 2 in order to discuss buildability from the outset. This requires a significant shift away from more traditional forms of design and procurement. The industry still has a long way to go in this regard as The Farmer Review of the Construction Labour Model 2 made clear – declaring in its title that the industry needs to ‘Modernise or Die’. Among the recommendations outlined in the Farmer Review are ‘pre manufactured approaches’ – such as CLT / Solid timber structures. DfMA methodology is integral to the design, manufacture and assembly of solid timber buildings and to how we work at Eurban. Ten years ago Eurban completed the installation of Waingels College, designed by Sheppard Robson. The term DfMA with reference to construction was not yet fully in use, however the adoption of earlier versions of the CAD/CAM software still used by Eurban today enabled structural design options to be explored, agreed and integrated into the project. The architects coordinated and signed off the drawings produced and these were then manufactured by the factory off site. Fast forward 8 years to 2017. Eurban now adopts far more sophisticated software and more rigorous QA processes to deliver projects. 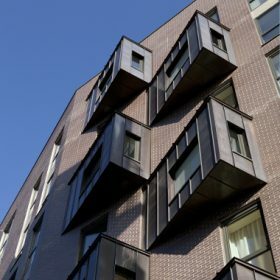 Two recently completed buildings, Highpoint Terrace, a large 8-storey residential block in central London, and Frilford Golf club in Oxfordshire both employed advanced 3D BIM to develop the most efficient designs in terms of Manufacture in the factory and Assembly on site. During the design phase of Highpoint Terrace, Eurban’s specialist timber engineers designed the most efficient structural solution, significantly reducing the number of elements by designing large 16m floor panels. A reduced number of operations on site should lead to increased safety. 25% less labour was required to assemble this building, only 8 site operatives as opposed to 35 if it had been a concrete structure. DfMA hand-in-hand with BIM enables much better risk management. 4D BIM gives design teams the opportunity to develop the DfMA methodology one step further. Both projects introduced the 4th dimension to the BIM models: time. The entire solid timber superstructure assembly can be modelled before work begins on site. 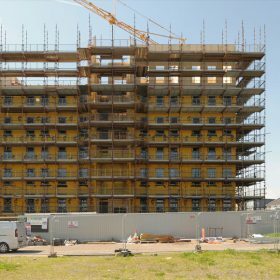 Crane locations and lifts, material set down areas, deliveries, and labour requirements can all be mapped out and communicated to the design team. This brings real advantages: sequencing issues and risks can be identified and addressed earlier, giving stakeholders and clients a high degree of insight and control over the process. Prefabrication of elements off site helps reduce the time on site along with standardised assembly practices, high degrees of accuracy and just-in-time delivery. Solid timber is a carbon store, it is one of the most effective ways to reduce carbon emissions. Highpoint Terrace required under a quarter of the labour that would have been needed for a concrete building, 8 rather than 35 erected the building. 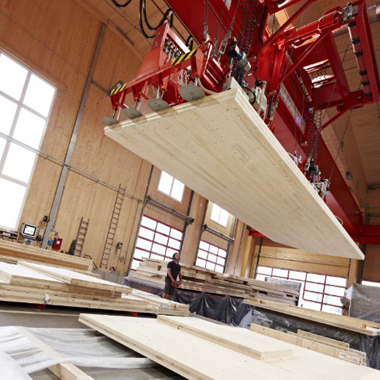 Solid timber construction stores carbon rather than producing it – therefore contributing to the combat against climate change. Fewer traffic movements to and from site reduces neighbourhood congestion, pollution and disturbance. Solid timber building structures are typically 40% lighter than reinforced concrete structures, therefore requiring reduced foundations. The continued use and improvement of DfMA design methodologies should enable projects to become more efficient and enable government targets in the sector for greater productivity and lower emissions to be met. 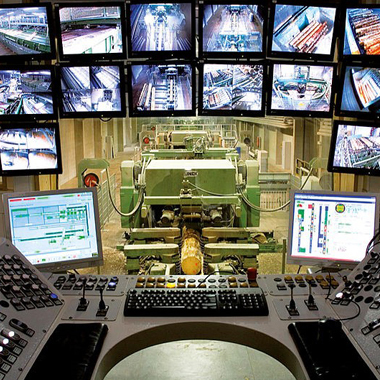 The solid timber industry continues to grow in this country, in Europe and globally. New production plants are opening for business all over the world while existing plants are increasing their capacity by extending and opening new sites. DfMA may require higher expenditure earlier in the design phase due to fees for specialists, but this early expenditure leads to greater predictability and therefore pays off during the build phase. When client bodies understand the longer term gain of early investment their projects should reap the benefits.